Battleborn comes out on May 3. Bust a move. The universe is fading to black, its stars snuffed out, one by one, by a force of pure, mad malevolence. All have fallen—all but one. And now it comes to this. To you. The final line is drawn. Here, and now, is where hope lives or dies. Now let's dance! No one can accuse 2K of taking Battleborn too seriously, which is probably appropriate given that its story-lite lineup includes a “space luchadore” whose arms were ripped out in his last match and what appears to be a sentient penguin piloting a battlemech. Even the breakdown of the skeletal plot upon which all of the shooting and stabbing is hung has a certain ring of “Yeah, whatever” to it. 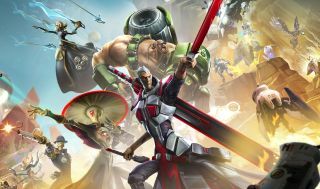 As a “need-to-know,” that's pretty thin, and so I will direct your attention (after you're doing enjoying the trailer) to our March hands-on with Battleborn's Incursion Mode for a better look at what it's all about. Battleborn comes out on May 3.